Are you curled up in bed for a day or more each month with one thought: “What am I going to do about these period cramps?” You are not alone, as 50% of menstruating women have the same experience month after month. But why suffer when you could be living pain free? NSAIDs (Non-steroidal anti-inflammatory drugs*) only mask the pain for a few short hours. Chinese herbal medicine, on the other hand, has been used for centuries with well-documented results. Also known as the "female ginseng," it is commonly used to regulate the menstrual cycle and relieve menstrual cramps. It also helps to relieve menopausal symptoms, reduce PMS and anemia and to re-establish a menstrual cycle after cessation of birth control pills. It is commonly sold as a single herb tea, bagged or loose. It is considered a king herb or premier herb in Chinese gynecological disease because of its ability to harmonize the blood in Chinese medicine. Dong Gui is also considered antispasmodic. The coumarin chemicals present in this herb may help dilate blood vessels and relax the smooth muscles of the uterus, thus relieving menstrual cramping. This herb is also a key medicinal herb for treating pain. It improves blood circulation and promotes the flow of "qi" or vital energy. Chinese women, dating back to the Song Dynasty, used to take this Chinese herb in the form of soup. The soup is called a Four Substance Decoction and includes three other herbs: angelica, red peony and Chinese foxglove. The soup and tea are still used today as a blood tonic to relieve PMS, stop menstrual pain and improve overall health, especially after giving birth. White Peony Root nourishes the blood and improves circulation. It is also used for a wide variety of gynecological problems. The peony root is considered a liver tonic in Chinese medicine. By strengthening the liver, it helps to increase the efficiency of protein and fat metabolism, thus inhibiting the excessive synthesis of prostaglandins that may cause an over-active uterus and endometrial pain. There are two main functions of this Chinese herb: to strengthen blood circulation and to relieve pain. In conjunction with chuan xiong it is known to help both body aches and headaches. Corydalis is related to the opium poppy. Although only 1% in strength compared to opium, it is a very effective pain reliever. The active chemical constituent di- tetrahydropalmatine (THP) is a neuroactive alkaloid with analgesic action that relieves cramping pain. Chinese herbal medicine can be a bit intimidating when you don’t know anything about these herbs, and the five herbs above are only a few of the herbs beneficial for menstrual cramps in the Chinese herbal encyclopedias. Asian pharmacies sell prescriptions of herbal teas and pills daily, and Asian cultures have used herbs successfully for hundreds of years. By replacing NSAIDs with Chinese herbs, women receive an additional benefit of avoiding the nasty NSAIDs side effects such as upset stomach, heartburn, ulcers and rashes, and liver damage, to name a few. Women don’t need to suffer month after month. You can use Chinese herb supplements to be pain free and PMS symptom free all month long. Source; Zhu X, et al "Chinese herbal medicine for primary dysmenorrhoea" Cochrane Database of Systematic Reviews 2007;3: CD005288. 1. 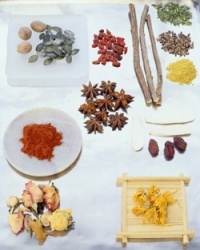 Chinese Medicine Program at the University of Western Sydney.1 (fourth issue for 2007 of The Cochrane Library). 2. Yin, J. Modern Research and Clinical Application of Chinese Materia Medica (2) pp 218-219 Beijing: Chinese Medical Classic Press. * NSAID are Non-Sterodial Anti-Inflammatory Drugs. Generics and name brands include: ibuprofen, Advil, Motrin, naproxen sodium, Aleve, aspirin, Bayer, Bufferin, acetaminophen, and Tylenol. ©2014 South Hill Acupuncture Clinic. All Rights Reserved.